Relieve Joint Pain & Boost Mobility! Proven joint care for every age, size, or breed! Formulated to relieve pain & increase mobility! Over 100,000 happy customers! BBB® A+ Rating! Help your dog live a longer, happier life! Order today and save 80%! No Trial, No Strings Attached! 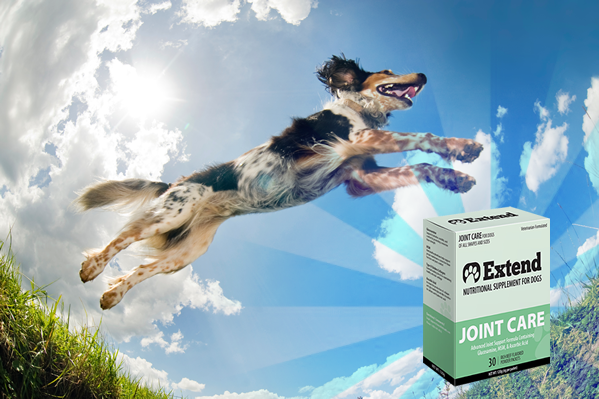 Extend™ Joint Care for Dogs is a complete, effective, and proven formulation of advanced joint support! 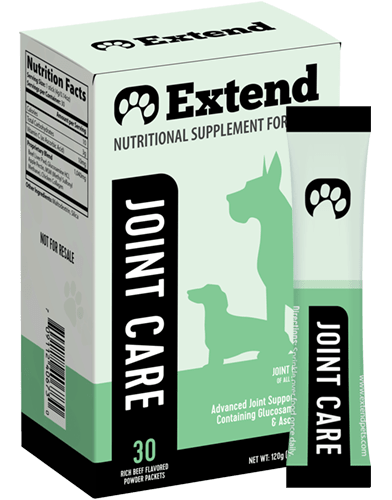 Extend™ Joint Care is an effective joint care formula available for dogs and is exclusively formulated to help nourish, heal, and strengthen joints, cartilage, and bones of aging dogs. Extend™ Joint Care provides natural building blocks for growth, repair and maintenance of cartilage, thanks to a newly-discovered, extra-absorbable form of Glucosamine. It begins working immediately to lubricate joints, help cartilage retain water and prevent future breakdown. By themselves, these ingredients do an OK job of helping your dog. 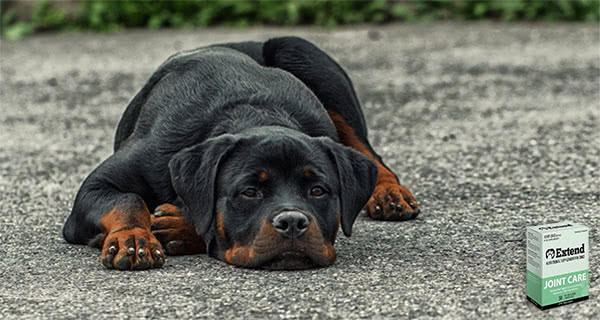 However, when carefully incorporated into an ideal ratio, they combine to become a powerful force in maintaining your dog's joints and limbs, and reducing joint pain. More Amazing Stories From Our Customers! "Extend has done wonders for my two elderly dogs, so I got some for My Mom's 16 year old pictured here......."
"She was losing interest in everything and now she wants to play again and explore outside. It has made a tremendous difference for her!" "My heart was breaking two weeks ago......My last ditch effort was trying Extend. So very glad I did!"" "In about 8 days, my 14 year old Aussie is running, jumping up and down, not falling down anymore and not sleeping 20 plus hours a day." "After a few days on this product, he got much, much better!" "I ordered Extend a few months ago when my Boo was noticeably slowing down, aching, and getting way to grouchy when anyone got near him. I had to drag him..."
We have collected insightful reviews of Extend Joint Care for Dogs from trusted third parties such as The Better Business Bureau, Amazon, Google, and more. Read The Rave Reviews! Is it Normal wear and tear? Hip Dysplasia? Arthritis? Autoimmune disorder? Know the signs and symptoms so you know best how to treat your dog's joint pain. 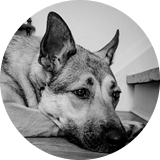 Learn more about your dog’s joint pain. Our formula uses precision-compounding and advanced absorption to nourish, heal, and strengthen joints, cartilage, and bones of aging dogs. It is designed to be safe and effective on your dog, regardless of size, age, or breed. It will work on your 12 year old Great Dane or your 9 month old Teacup Schnauzer. Our formula contain only the highest quality Glucosamine, MSM, Type II Chicken Collagen, and Ascorbic Acid. Every little step in creating this revolutionary formula, no matter how small, occurred under the trained eye of caring, licensed veterinarians. How A Little Powder Changed My Dog's Life! "We thought Bo was on her last leg..."
Great product that really works, sure has helped my 15 year old Blondie Doodle, I was about to have her put down but gave extend the chance to work, and low and behold , 4 weeks later I noticed the improvement. Thanx so much. 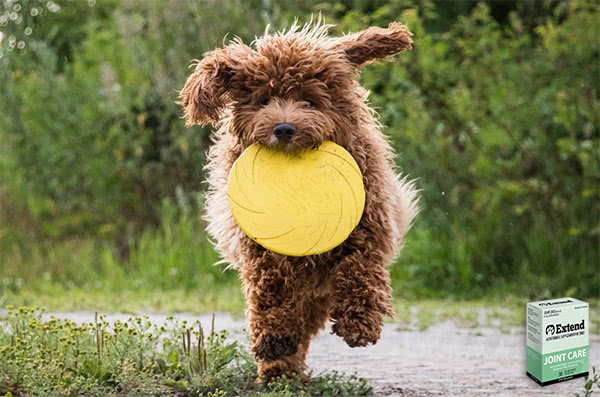 I have ordered the sample and after four days of having it my dog Gabby is not in pain and acting like a puppy and wanting to play like she used to! She is so happy and playful! I will be ordering more!!! When I was recently at my local vet to having my two dog's vaccinated, a woman sitting next to me who had an 11 year old dog was amazed that my dog Raffles was nearly 14. Her 11 year old dog looked and acted so much older than Raff. I told her about Extend and she put it her phone. Many of the dog owners I meet have their elderly dogs on medication while Raff is only on Extend. I find it incredibly easy to talk about how great the product is. This has really helped my 5yr old dog who has early hip dysplasia. After only two weeks of giving her this powder on her dog food she is acting like a 5yr old dog, running and playing, great stuff! I use this product and it works! We hav a 16 year old Dutch Shepherd, and she was becoming incontinent and losing her mobility in her hips and right hind leg. After a few weeks, no more incontinence, she sometimes prances like a puppy, and is so much better. Worth the $$ and she loves it. I use the powder. She is on her 3rd month and we are thinking of cutting back to every other day because she is so active now, climbing stairs without a problem. I give my 15 year old collie German shepherd both Extend Joint Care for Dogs and Free Form Snip Tips once a day and it's done wonders for his joints and energy! Started my yellow lab, Spirit, on Extend a little more than a month ago. He turns 9 years old in 2 weeks. I cannot tell you what a difference I see in him. He is moving up and down our staircase with ease, jogging on walks, but most importanly, he is back to jumping from the floor to the bed with me each night. I'm a believer is this stuff. If you are sitting there reading this, and wondering if it really works....IT DOES. Our newly-discovered form of Glucosamine is absorbed faster to better support hydration, mobility, and comfort. Methylsulfonylmethane is an organic compound that works to heal and elasticize connective tissue for added mobility and resiliance. Collagen is the essential building block for maintaining healthy articular cartilage. As they age, dogs' bodies produce less and less of this vital substance. Increases the production of collagen and glycosaminoglycans like chondroitin sulfates and hyaluronic acid, and works as a turbo-charged delivery system of nutrients to affected joints. Plus a natural, meaty taste that your dog will love! What is Extend™ Joint Care? Extend™ Joint Care for Dogs combines four active ingredients in a single non-prescription dietary supplement designed to improve and maintain joint health in your dog. Our unique blend consists of Glucosamine HCL, MSM (Methyl Sulfonyl Methane), Type II Chicken Collagen, and Ascorbic Acid. Each ingredient plays a vital role in supporting hip and joint health in your Dog. At Extend Pet Health, we have formulated this product to be one of the safest and most effective joint care supplements for your dog, supporting healthy joints. Extend™ Joint Care is the simple way to help ensure that your dog's joints stay healthy and strong through the course of their whole lives. Four active ingredients work synergistically to support joint health, increase joint strength and viscosity, and protect joint cartilage from damage and wear. For additional details, read up on how it works. Is Extend™ Joint Care safe? Extend™ Joint Care is not known to have any side effects or contraindications. Glucosamine has previously been associated with gastrointestinal upset and increased urination in some dogs. In this event, glucosamine should no longer be administered. Extend™ Joint Care is not intended for use in other animals. Feel free to ask your Vet! We have not yet heard of a vet who has did not recommend it after seeing the ingredients! My veterinarian doesn’t know what Extend™ Joint Care is. What can I do? We're not surprised, as our company is small, though growing fast! If your veterinarian is not familiar with Extend™ Joint Care, please have them email questions to support@extendpets.com. 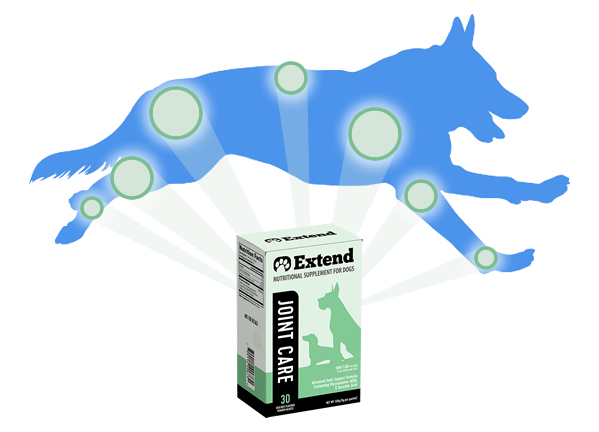 When can I expect to see results from my dog taking Extend™ Joint Care? Extend™ Joint Care goes to work at the cellular level right away, though it may take a short period of time for the effects to manifest themselves. While many happy customers have seen dramatic results in a few short days, know that every dog is different. We recommend waiting two weeks before expecting any visible results. Is there any kind of guarantee for Extend™ Joint Care? Yes. We offer a 30-day 100% money back guarantee for our Extend™ Joint Care if you are not completely satisfied. Just return the unused portion and we’ll refund the full cost of the product. Shipping charges are non-refundable. Please include your receipt or packing slip if available. We’re happy to help if you have questions or need assistance in any way. Just let us know! *Results May Vary. Not intended for human consumption. Please consult your veterinarian regarding any change in treatment or supplementation.